Just as Dr. Haynes is passionate about helping people, his patients love to share their success stories with others. Browse reviews from our patients as well as the collection of celebrity reviews, then contact our office to get started! It is wonderful to go to a Dr. that shows care and concern! It is nice to see the office part of the business run so efficiently! “Dr. JD Haynes at Live Well Chiropractic has created a comfortable & caring environment that reminds me of what a family doctor should be…personal, thorough, and caring…not just one of those in/out offices that simply want to bill you or your insurance. With my first adjustment I was impressed on how easy it was to trust Dr. Haynes, which is not common among first visits with new doctors…my body allowed him to make real progress. After seeing him weekly for the last 7 months I have noticed relief in my chronic neck/back issues, as well as a reduction of hip pain due to rotated hips, which have included helpful exercises to maintain my adjustments in between. I have followed him to his new practice, Live Well Chiropractic & Wellness, and I’ve happily referred friends who have experience the same level of care so I know it’s not just me. Even going beyond his own practice, Dr. JD did not hesitate to write a letter to my insurance in support of a major surgery. His letter showed an understanding of the human body without being a “cut and paste” form that I received from other doctors. 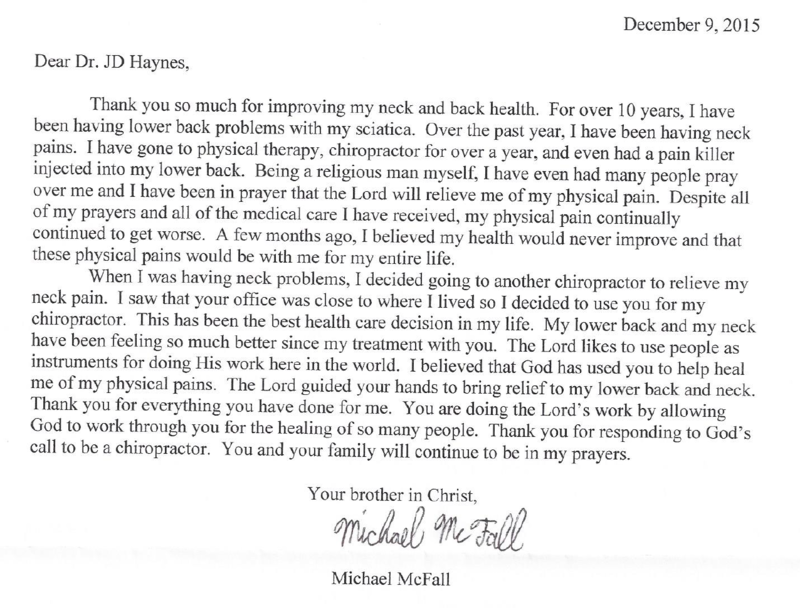 It was clearly indicated in his letter he has an understanding of both the long/short term affects of not properly caring for the spine, which can cause other health issues…not just treating the symptom, but correcting the cause. In discussion of his experience with infants, pregnant women & elderly patients…I’m looking forward to still receiving my adjustments while I am recovering from surgery. “Live Well Chiropractic & Wellness has the BEST doctor! Dr. Haynes is very personable and great with kids…they can’t wait to see Dr. JD for their adjustments. He has been a huge help not only alleviating some aches and pains, but we have found that our family is healthier and stays healthy when we continue to have chiropractic for maintenance care. It’s amazing what chiropractic care can do for kids…whether it’s ear infections, allergies, asthma, the cold/flu…we get our kids adjusted! People always ask how we have the healthiest kids…I tell them we get adjusted. “I had the pleasure of meeting Dr. Haynes a few months ago. After learning that he was a chiropractor I told him that from time to time I would have severe neck pain and that my neck would “lock up”. After a week or two it would eventually go away….so as long as it kept going away, I didn’t think there was a major problem. He took a moment to explain to me why I should pay attention to these warning signs and offered for me to visit Live Well Chiropractic for a consult. I am so glad I went…one of the best decisions I have ever made. The office is great and his staff is very friendly…it felt like family. More importantly, we found the cause of my pain. He took the time to explain why it was happening and what we needed to do to get things moving in the right direction. I was a little scared since I have only heard about chiropractors, but I have to tell you it was great! After just a few adjustments my neck had never felt better. “I started seeing Dr. Haynes at Live Well a few weeks ago for lower back and sciatic pain. I had never seen a chiropractor before, and must admit I was a little skeptical that it would help my pain. I am SO glad I went! I’ve had a history of back pain since I was a teenager, but usually it would come a couple of times a year for a few days then subside after pain meds & rest. This time was different. I have never been in so much pain before and never have I been incapacitated. I couldn’t even hold my baby or walk. Having gone alternate routes for treatment I was in such pain I didn’t know what to do because nothing was working. That’s when I saw Dr. Haynes. During my consult, he addressed my concerns but also took the time to explain why this was happening, the seriousness of the warning signs, and how we could work together to correct the root issue. I’m feeling so much better! I can tell a HUGE difference in my mobility and it relieved the stress in my upper back and neck.